Flaster/Greenberg PC, one of the Delaware Valley's leading law firms, has partnered with Green Technology Recycling to take part in their e-Waste program in an effort to recycle and dispose of all unwanted electronic devices. Flaster/Greenberg is the first law firm in South Jersey to take part in an e-Waste initiative with Green Technology Recycling, also extending this service to their employees. Considering everyday the world disposes of 130,000 tons of electronic waste, e-Waste programs can make a tremendous impact in any business and its environment. Over the last four months, the Flaster/Greenberg IT Department has spearheaded this initiative by designating e-Waste drop boxes in the firm’s Cherry Hill and Philadelphia office locations. Employees were encouraged to drop unwanted laptops, tablets, notebooks, desktops, monitors, keyboards, mice, drives, cell phones, and printers to be recycled. Green Technology Recycling will safely erase all data on the donated electronics with a Department of Defense certified 5 stage computer kill. 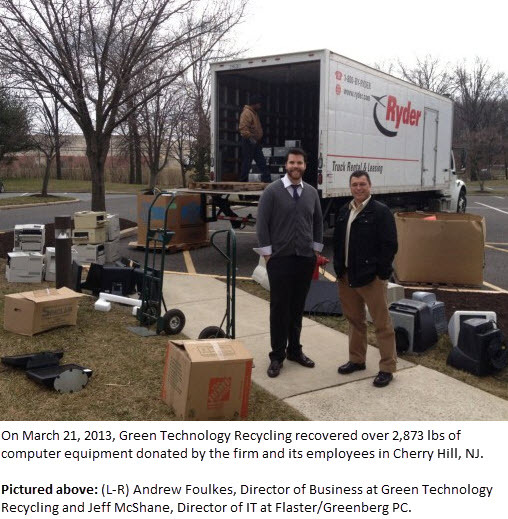 On March 21, 2013, Green Technology Recycling recovered over 2,873 lbs of computer equipment donated by the firm and its employees in Cherry Hill. The Philadelphia eWaste program is scheduled to take place early this summer. “Our partnership with Green Recycling Technology will ensure that none of our firm or employees’ harmful waste will ever reach a landfill, no toxins will be released into the environment and all of the data on the unwanted devices will be permanently deleted and destroyed, which is an ongoing concern with law firms,” said Jeff McShane, Director of IT at Flaster/Greenberg. Flaster/Greenberg’s recent partnership with Green Technology Recycling is just one of the many green-energy initiatives the firm, and its employees, have taken to reduce their carbon footprint. In January 2012, a year-long construction project was completed in the firm’s Cherry Hill office, installing motion sensor light switches, energy efficient light bulbs and using wallpaper made from recycled materials. Additionally, all cleaning products used in the office are green seal certified and the firm recycles all of its metal, plastic and paper waste. In February 2012, Flaster/Greenberg was featured in the Courier Post and on NBC10 for installing a level two electric car charging station in the firm’s Cherry Hill office parking lot. The charging station is a courtesy for clients who drive electric cars and an incentive for employees to buy environmentally friendly vehicles. Since the installation of the car charging station, Flaster/Greenberg has been recognized for their eco-friendly approach to green energy initiatives by a variety of local organizations. The firm was recognized as one of South Jersey’s most green and eco-friendly companies in the April 2012 issue of South Jersey Biz magazine and honored in the publication’s 2012 Green Awards. Most recently, Flaster/Greenberg was selected to receive the 2012 Environmental Advocate of the Year award by the South Jersey Chapter of the National Association of Women Business Owners.